"Climate Change Litigation in Asia and the Pacific"
Abstract: The vast majority of climate change litigation has taken place in the European Union (EU) and the United States (US). In the Asia Pacific region, there has been no climate change litigation, with the notable exception of Australia and to a lesser extent, New Zealand. This chapter will review selected case law from Australia and New Zealand. Further, commentators have argued that the conditions are ripe in certain jurisdictions like India and the Philippines for the use of climate change litigation as part of a broader advocacy strategy to press for governmental action to address climate change. 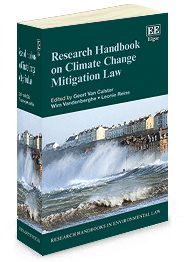 Even though it is most likely that these cases will focus on climate change adaptation, rather than mitigation, this chapter will discuss the India and the Philippines case studies to shed light on broader questions of why mitigation-centric climate change litigation may not take off the way it has in the US and EU.